Monday morning, Ford revealed details of the new diesel-powered 2018 Ford F-150 Power Stroke, which it claims will achieve an EPA-estimated fuel-economy rating of 30 mpg highway when it goes on sale this spring. Under its hood sits a 3.0-liter V-6 turbodiesel, putting the new version of the truck toe-to-toe with the 2018 Ram 1500 EcoDiesel, also powered by a 3.0-liter turbodiesel V-6 but rated at 29 mpg highway. 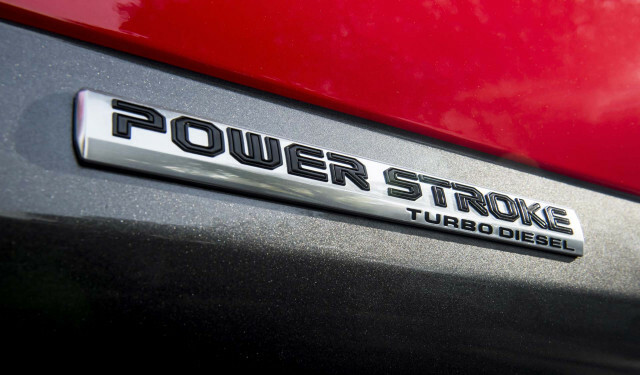 Ford's new turbodiesel is rated at 250 horsepower and 440 lb-ft of torque—narrowly edging the Ram's 240 hp and 420 lb-ft—with the ability to tow 11,400 pounds and haul 2,020 pounds. Ford says the new engine produces its peak torque at 1,750 rpm, "which is ideal for towing or hauling heavy loads over long distances." Helping the diesel achieve as much efficiency as possible will be Ford's 10-speed automatic transmission (developed in partnership with General Motors), the F-150 aluminum body, and auto start/stop. Digging deeper, the 3.0-liter turbodiesel V-6 is not a clean-sheet design: It shares its basic engine block with previous diesel-powered Land Rovers and Range Rovers. The engine itself was developed more than 10 years ago, "but became a casualty of the recession in 2008," reported The Truth About Cars when it first leaked plans for the engine in 2014. The new diesel engine is one of two additional powertrains coming to the F-150 to augment its mainstay EcoBoost turbocharged gasoline engines. In 2014, Ford approved development of a hybrid F-150, which analysts assume will come to market regardless of any Trump Administration efforts to roll back current fuel-economy targets. The diesel engine will only be available on high-end F-150 Lariat, King Ranch, and Platinum models for retail customers, though fleet customers will be able to order the diesel with the less pricey XL and XLT trims.